Dr. Greg is back tonight with a retro-review - Santa's Sleigh from Playing Mantis. Take it away, Doc! Dr. Greg here with another diagnosis. The patient this time is Santa’s Sleigh and Reindeer Team from Playing Mantis (PM). I know, I know, Christmas is long past. That’s why I just picked this toy up, because it was being sold at DEEP DISCOUNT at TRU.com. Cha-ching! I paid less than $15.00 for this baby, and the SRP was more than $50.00. Patience, as they say, has its rewards. I should know, because I have been patiently waiting for this toy since I was 6 or 7 years old, along with many other boomers. I mean, what child of the 60’s and/or 70’s didn’t want this? Consistent with the entire line, this has bold and bright colors, with pictures from the show and from other products in the line. Oh, and it’s HUGE! At 29.5 inches it’s turn it sideways to get it through the door huge. 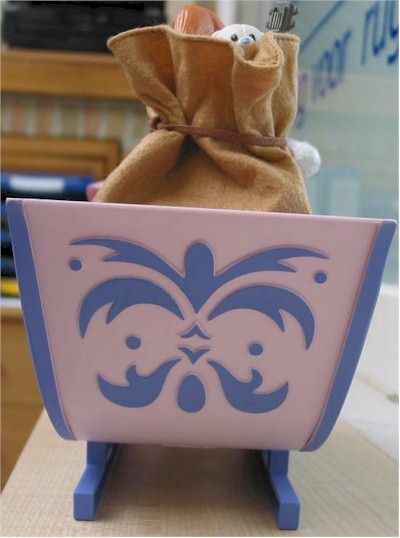 Great for display, although I can’t imagine anybody being able to resist opening the box. 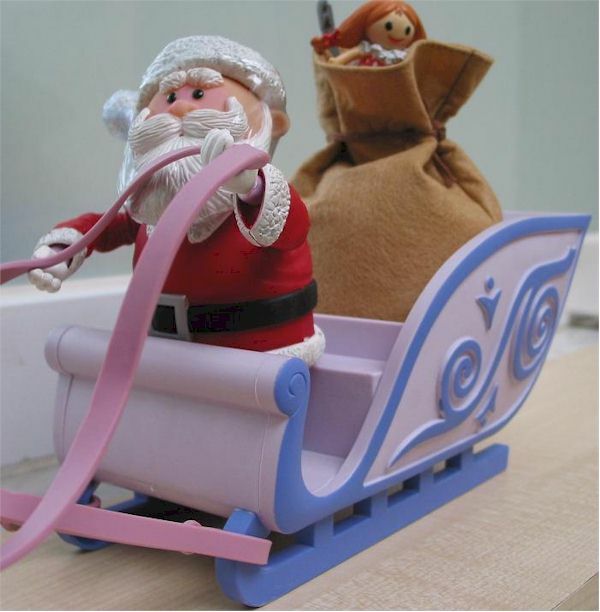 My biggest problem was the inner ‘cloud’ base that the figures and sleigh are attached to inside the box (and I do mean attached, with more than 45 twisty ties!). Mine was broken at the front and, even though I didn’t plan to use it, if I had I’m not sure it would be sturdy enough to last for very long. Actually, I’m sure. The thing is flimsy. If I had my ultimate wish, it would have been to have a styrofoam cloud base come with this, with small posts for each reindeer so that I could position them in various ‘flying’ positions. I would also have liked to see more pictures from the actual show on the box, especially here where they definitely had the room for them. Maybe next year? This would have gotten a 4 if only for one problem. Playing Mantis promised 6 different reindeer head sculpts and, as far as I can see, there are 2 (not including Rudolph). The eyes and noses are PAINTED differently, but there are only 2 different sculpts, and they are only slightly different. That problem aside, they sculpts are top drawer. As with the rest of the line, they all look as if they stepped right out of the film. Santa we’ve seen before, and I saw no discernable changes with him. Of course, Rudolph as portrayed here is now a ‘young buck’, and looks fantastic, as well as Santa’s Sleigh. PM seems to have their sculpting down pat, and I’ve been pleased with all of their other new Rudolph figures this year. I have just 1 wish here, that being a magnet system a la the Muppets to hold Santa’s hat in place. One thing that has been a disappointment for me this year is the slight downturn in PM’s paint applications. Santa, although an exact copy of last year, is the worst. He has multiple spots where there is no paint, and the white of his jacket, hat, and beard are badly spotted. It looks to me as if they tried a wash to bring out the highlights and it didn’t take, making these areas appear very sloppy. The finer points on Rudolph are well done, with very little slop, as well as the rest of the reindeer, but again I see that there was a wash used here that, although not hideous, isn’t up to the same standards as last year. Their fur looks more like plastic, whereas Rudolph and Clarice from last year looked more like ‘fur’. The eyes, noses, and hooves are all very well done however, considering their small size, with very little slop. 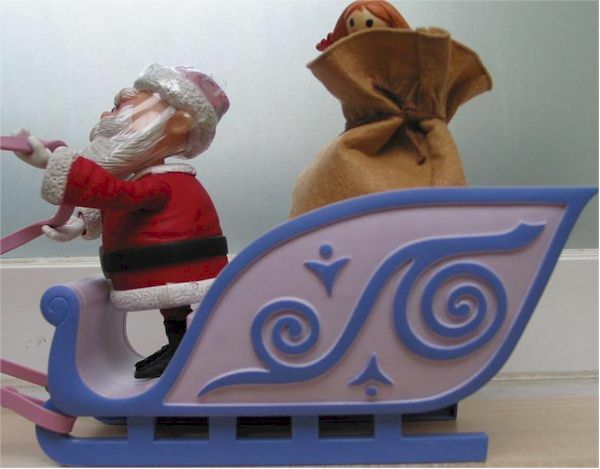 The sleigh also looks very nice, even though it is rather basic. (I suppose it was also basic in the show.) I hope that I was just unlucky with my set, as I’ve been pleased in the past with PM’s work and I would hate to see this as a trend. I would have loved to have seen a neck joint on the reindeer that allowed better head positioning, but alas that was not to be. They all have the same 5 points as last years deer; shoulders, hips, and neck. Another joint in 1 (or both) of the front legs would have upped the poseability a bit too. 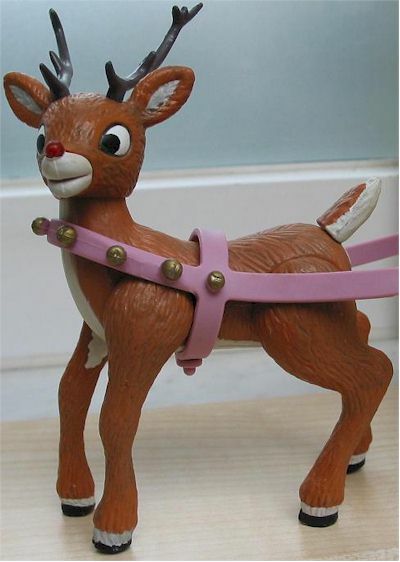 Rudolph has one extra joint, as his tail can move to enable the light up effect of his nose. Santa is exactly the same as last year, with neck, shoulder, wrist, waist and ankle joints, which is plenty for him. I suppose I should add the reindeer harness in here as I don’t know where else to put it.Not bad at all, it is heavy rubber and allows for a modicum of movement for the reindeer. Real jingling bells would have been sweet, but I’m just dreaming. The only thing here that qualifies is Santa’s toy bag. Personally I would have liked to have seen at least one pvc toy in there. It’s big however, and looks nice in the sleigh. I’ve already stuffed mine with a spare misfit doll, elephant, and Sam’s banjo. Besides the bag, I can’t really think of anything else that there could have been. Feed buckets? A reindeer pooper scooper? A map for Santa? In all honesty I bought this toy for myself, but my kids played with it for a short period of time and the diagnosis wasn’t good. 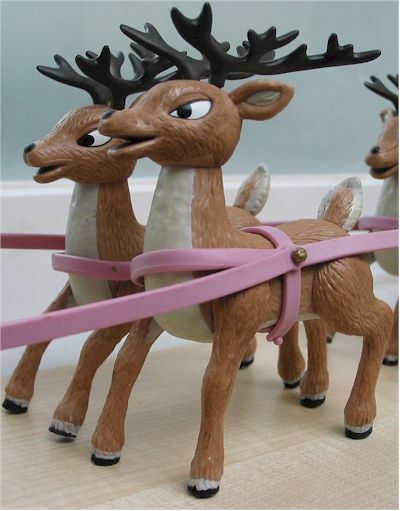 The problem is that, since everything is attached by way of the rubber harness, every time Alex or Kiki would try to move the sleigh or a particular reindeer they would all fall over. This was very frustrating and, even though they love the show, their interest quickly faded. For collectors and fans of the show this is a real treat. I must caution that it does take up a huge amount of display space, but I remedied that somewhat by displaying other figures around it. On display it looks awesome, and I can’t wait until next year and my yearly Christmas diorama to show it off to everybody. As I commented under packaging, it would have been perfect if a Styrofoam cloud base come with this, with small posts to position the reindeer in various ‘flying’ positions. (If I saw the recent Toy Fair pics correctly, it looks as if PM has had a similar idea as I saw Rudolph posed on what looked like a clear Lucite post in a ‘flying’ position.) It’s not perfect, but it comes close and I am personally very happy with it. This depends on where you're shopping. At an SRP of forty bucks, he's too expensive, considering the other figures on the market in that range. But with most stores selling these in the $30-$35 range, you have some other options. Add a half star if you get it for $5 or more cheaper, and if you can find it for under $30, that's extremely good. I give this set a áááá for a couple of reasons. The first is because this is really a very impressive set. I mean, who would have thought that any company would dare make such a huge boxed set?! 8 action figures plus a vehicle?! Unbelievable. The risk alone was probably enough to turn off most companies, but Playing Mantis swallowed hard and made the dreams of countless Rudolph fans finally come true. The quality, while not perfect, was definitely higher than average, and the coolness factor is off the charts. In other words, anyone who loves Christmas and/or Rudolph MUST buy this set. And that's MY diagnosis. Figure from the collection of Dr. Greg.